Most hikers in Capitol Reef National Park will stick to the 15 maintained trails in the principal Fremont River District. But it is the remote and scintillating backcountry that harbors the park’s greatest gems. After last month presenting a (subjective) list of the ten best hikes in the park’s “frontcountry,” this post will outline the best of the rest: beautiful treks to far-flung places, from splendid narrows and martian landscapes to sweeping alcoves and stunning vistas, and, of course, epic slot canyons of all lengths and difficulties. Best completed as a shuttle hike, Upper Spring Canyon makes for a very long day hike or a relatively relaxing overnight. 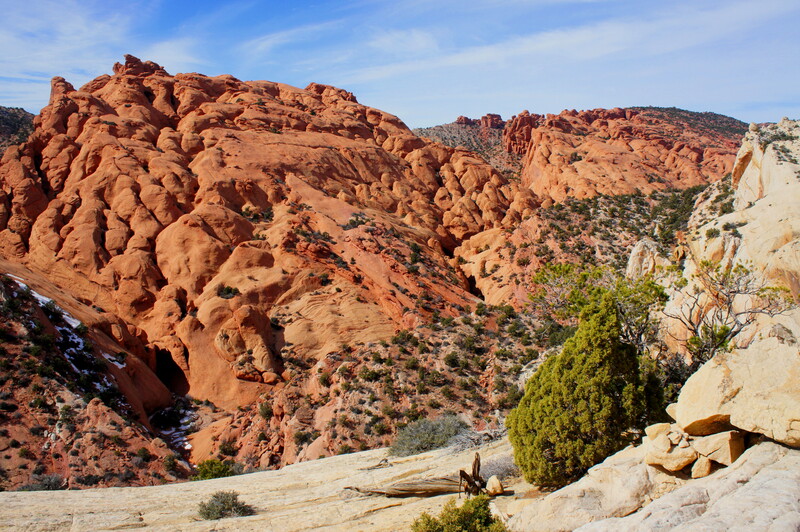 Route finding can be challenging, but visitors are rewarded with sublime surroundings of seemingly endless red-orange Wingate sandstone, which forms the bulk of the canyon walls. Watch for petrified logs and tall Douglas firs on the approach to the “W,” and stop for a rest below the cottonwood trees just past the spring for which the canyon was named. If the 18.5-mile through hike is not in the cards, consider meandering up Spring Canyon a ways from the Chimney Rock Trail, and return the way you came. See my post on March 23, 2015 for a full route description. Headquarters Canyon boasts one of the park’s few easily-navigable slots—in addition to dizzyingly high cliff faces, diverse vegetation, and a beautiful stretch of pink-ribboned walls. It’s no wonder that a number of past Capitol Reef employees have proposed establishing the park headquarters near this site. This short hike is ideal for families and budding explorers looking for a relatively quick wilderness adventure. See my post on February 12, 2015 for a full route description. Capitol Reef’s Cathedral Valley is easily the least-visited of the park’s three districts, meaning the sight of hikers on its half-dozen trails and routes is rare. Probably the best hike in the area is the 1.1-mile Cathedrals Trail, which follows a ridgeline overlooking a line of orange, deeply-textured monoliths from which the hike takes its name. While situated dozens of miles from anything resembling a modern amenity, the remote trail is surprisingly well-maintained. See my post on May 23, 2015 for a full trail description. 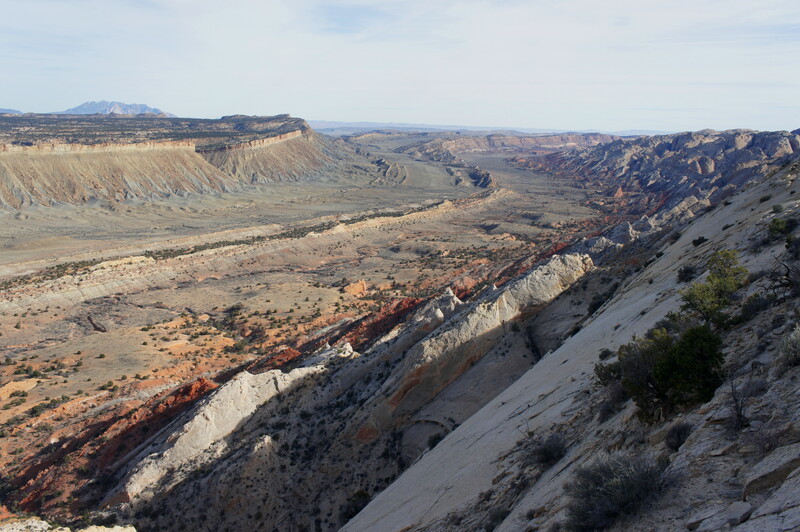 Strike Valley Overlook, situated far from the hustle and bustle of the tourist center of Fruita, is easily one of the finest and most serene vistas in Capitol Reef. From the viewpoint—atop a saddle in the Waterpocket Fold, a 100-mile wrinkle in the Earth’s crust—it is possible to discern nearly a dozen different rock layers; though each stratum maintains a different color and thickness, they line up almost neatly in nearly-parallel lines spanning Strike Valley below. On a clear afternoon or evening, the lofty Henry Mountains to the east add to the allure. See my post on February 22, 2015 for a full trail description. Sheets Gulch alternates between broad expanses and thin slots as it slices through the Waterpocket Fold. Relatively easy to reach from the Notom-Bullfrog Road—just outside the park—Sheets’ slot sections require a degree of strength and technique to master. However, less so than its neighbors—Burro Wash and Cottonwood Wash—the obstacles are not overly cumbersome. 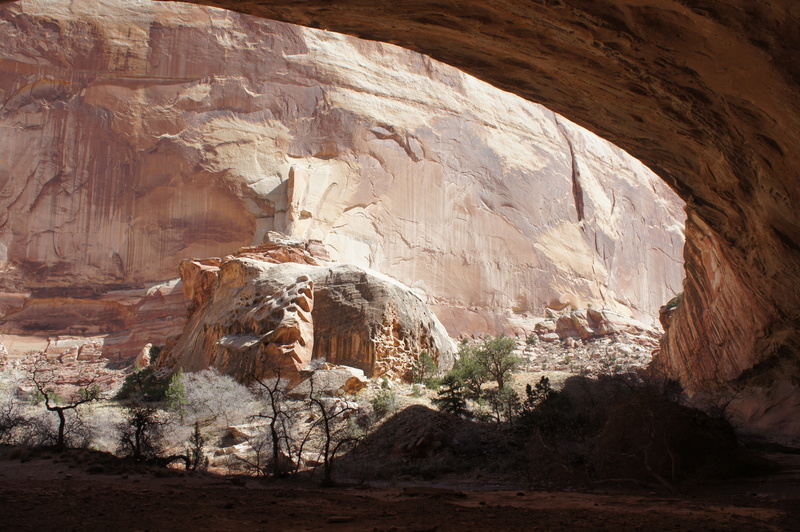 Around 2.5-3 miles from the trailhead, look for an impressive bowstring arch on the right. Most visitors will turn around at or before a chamber-like pouroff 4.5 miles in, but it is possible to continue on to the park’s west boundary and Tantalus Flats and the South Draw Road beyond. See my post on February 15, 2015 for a full route description. 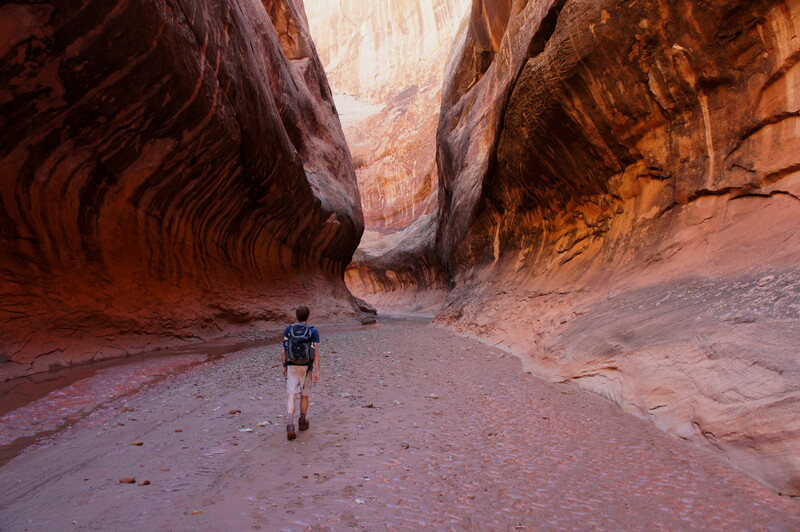 Burro Wash is arguably the most challenging, non-technical slot canyon in Capitol Reef. After a lengthy approach across wide, sandy flats, the canyon thins considerably as it slices through the Navajo sandstone. 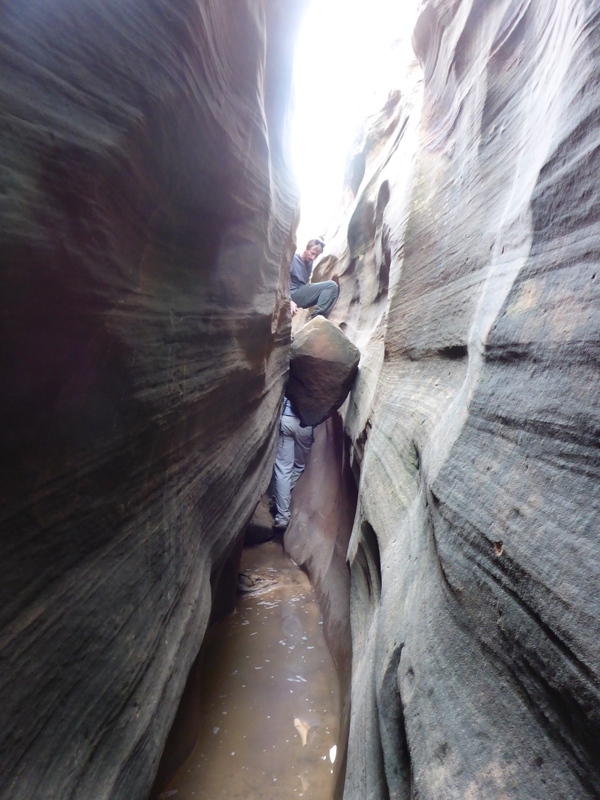 Each of the hike’s three solid slot sections includes high chockstones; the final slot is guarded by a difficult climb over a pair of chockstones, but the hearty are rewarded: the hike ends at an impassable pouroff in a stunning, fluted chamber in the Navajo. Lower Spring Canyon, like Upper Spring, is best tackled as a one-way shuttle hike—or an overnight. The wonders of Lower Spring Canyon are aplenty, from towering spires to narrow chasms to varnished alcoves to hidden arches. While most of the hike involves flat, easy walking, be prepared for a couple obstacles, including a hairy, exposed bypass around an impassable slot section, plus the wet and wild grand finale—a no-way-of-avoiding-it wade through the Fremont River at the mouth of Spring Canyon. See my post on March 11, 2015 for a full route description. 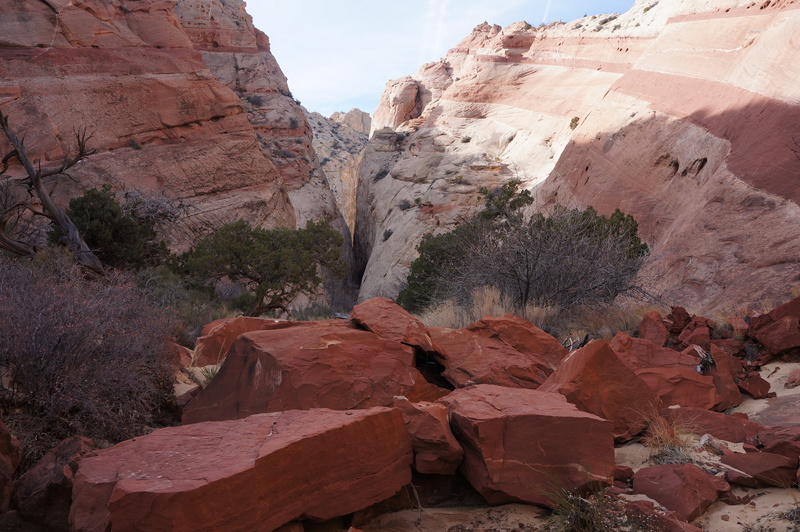 The hike through Lower Muley Twist Canyon is anything but straight. Over the course of 12 miles, the canyon twists and turns dozens of times, leaving behind a set of spectacular, crescent-curved alcoves, most adorned with beautiful desert varnish. 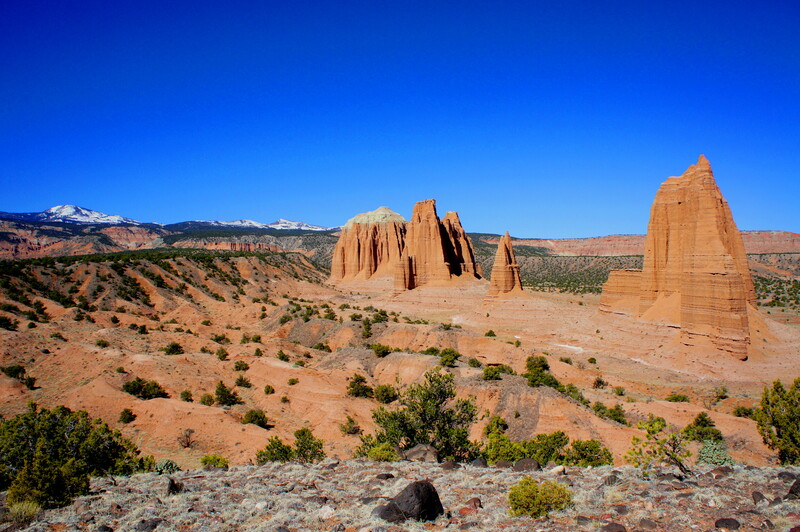 Starting and ending at The Post offers a loop option—including a 5-mile stretch through sun-soaked Grand Gulch—and provides access to a mile-long spur to Hamburger Rocks, a peculiar collection of stout hoodoos situated on a sunny sandstone slope resembling a set of burgers on a frying pan. See my post on March 30, 2015 for a full route description. The northern cousin to Lower Muley, the Upper Muley Twist Canyon hike weaves through a playground of wildly-eroded slickrock, muffin-shaped knobs, natural arches, and narrow slots before climbing to the top of the Waterpocket Fold for spectacular views of Strike Valley and the Henry Mountains. 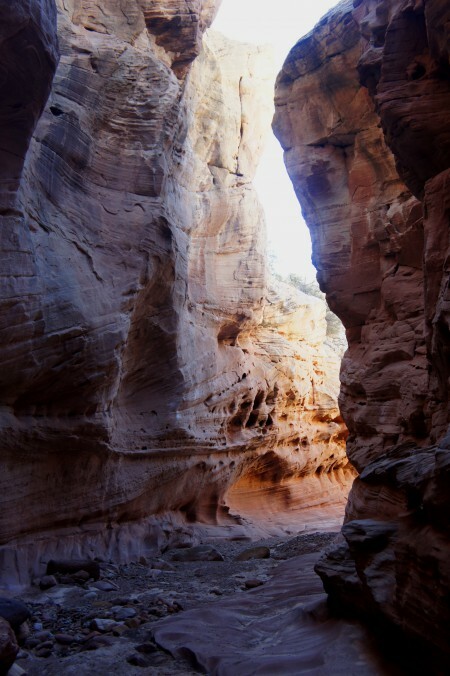 A series of lofty apertures are visible from the route, the most impressive being Saddle Arch, perched high above the muddy wash bottom at a point where the canyon and rim hikes part. Allot a full day for this strenuous stem-and-loop or, better yet, make it an overnight. See my post on March 1, 2015 for a full route description. 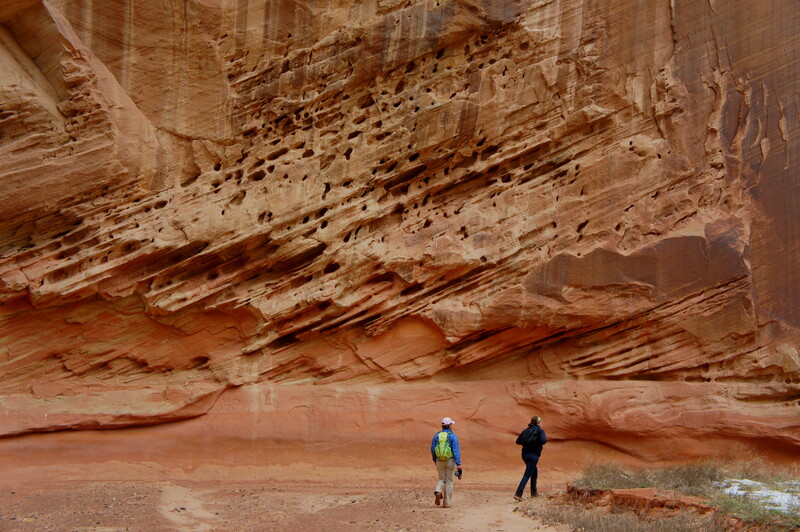 Halls Creek Narrows, arguably Capitol Reef’s finest attraction, is also probably the most remote. Tucked in the extreme southeast section of the park, the lengthy trek from the road to the narrows requires a long slog down sun-drenched Grand Gulch, some decent route-finding, and considerable patience. But the three miles of snaking meanders, vaulted walls, and varnished alcoves at Halls Creek Narrows are unforgettable. 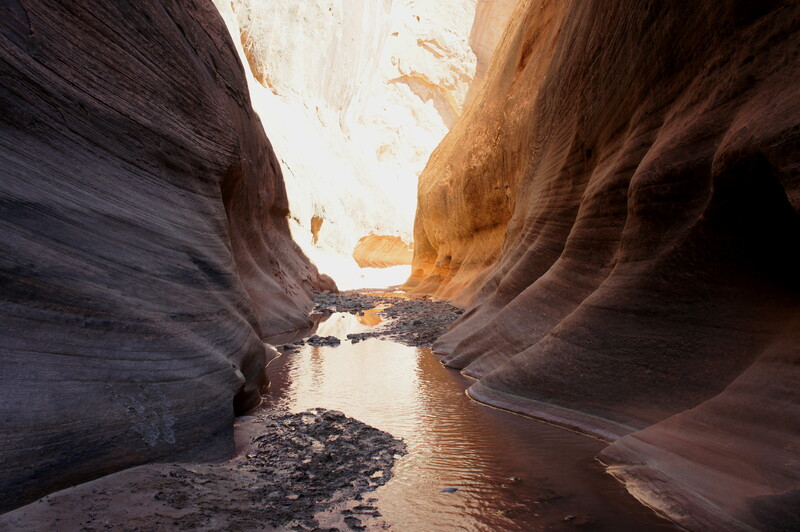 Camp in the “amphitheater” for a truly spectacular experience, and bring an extra pair of socks for the hike through the narrows—you are almost certain to get wet, as this section of Halls Creek holds water year-round. See my post on April 15, 2015 for a full route description. This entry was posted in Capitol Reef National Park, Utah and tagged best hike in Capitol Reef, best hikes, Burro Wash, Capitol Reef, Cathedrals Trail, Halls Creek Narrows, Hamburger Rocks, Headquarters Canyon, Lower Muley Twist Canyon, Lower Spring Canyon, Sheets Gulch, slot, Strike Valley Overlook, top 10 hikes, top 10 trails, top ten hikes, Upper Muley Twist Canyon, Upper Spring Canyon, Utah. Bookmark the permalink. Thanks the synopsis, Andrew. Although I haven’t been to Capitol Reef yet (but will be there in October for a couple of weeks) I think it worth mentioning that Upper Spring Canyon could be done as an up and back from Chimney Rock, as far as someone wished to go, without having to route find. Reading this from the east coast is tough. You mentioned several of our favorite hikes. Now I have a few more to add for our visit next spring:) I sure hope there is less rain next year! Spring Canyon is not to be missed if you love rocks like I do. And Sheetz Gulch was soooo much fun!! A few of those chokestones had us laughing especially coming back out. Being short can cause difficulty getting down at times. At one of the chokes, I actually had to come down on John’s head…too funny!! And of course, Upper Muley is spectacular! Wonderful post, Andrew! There are no style points in slot canyons! The more awkward the climb, the better! hi! any thoughts on how to get to lower muley or halls via shuttle or something similar? we were not planning to rent a 4WD! Thx! Hi Catherine – not sure of any formal shuttles, but–barring a recent snow or flood–you should be able to reach the Lower Muley Trailhead with a regular 2WD vehicle. Unfortunately for Halls Creek Narrows you’ll need 4WD. I really appreciate the info from your site. Thanks for compiling it all! We had an excellent first trip to Cap Reef last month and left knowing there is much left to explore. Can’t wait! 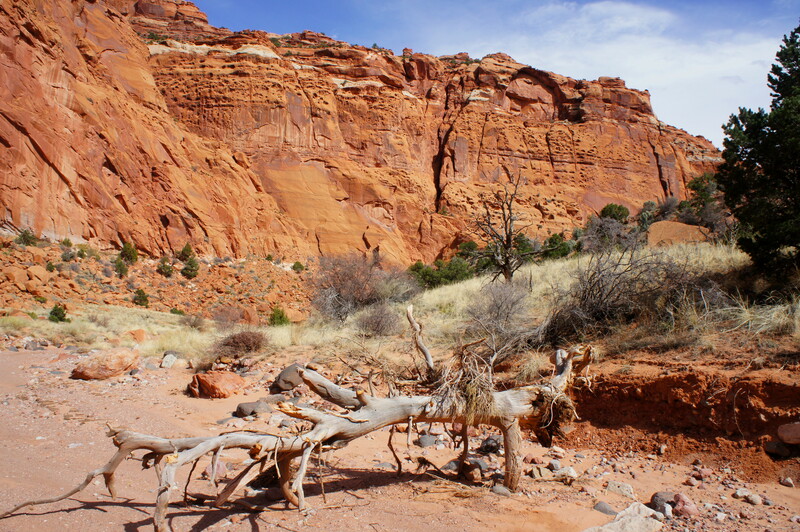 Just ran across your blog on Capitol Reef. We are headed there with friends over the next three weeks. Leaving Denver and heading to Utah via four corners route. We have hiked and backpacked in southern Utah many times but never Capitol Reef so we are excited to spend 4 or five days there. Your list of hikes is exactly what I was looking for. Many thanks for your research and trail ideas. We look forward to getting in as many day hikes as possible. Glad to hear it. Have an awesome trip!